Are you flooded with stress, anxiety, and thinking negative thoughts and are desperate to know how to take back control of your life? In Tapping the Healer Within, Dr. Roger Callahan shows you how to harness the healing power of Thought Field Therapy on your own, to overcome phobias, anxieties, addictions, and other common psychological problems. #mentalhealth #stress #depression #anxiety Fearless Social Confidence: Strategies to Conquer Insecurity, Eliminate Anxiety, and Handle Any Situation – How to Live and Speak Freely! Fearless Social Confidence: Strategies to Conquer Insecurity, Eliminate Anxiety, and Handle Any Situation – How to Live and Speak Freely! Do you freeze up and avoid people because it feels like they are judging and rejecting you? Is being self-conscious preventing you from living your life? The power of social confidence: it lets you see a world of possibility and potential versus a world of stressful anxiety and constant fear of failure. 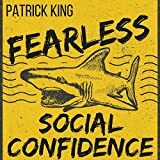 Fearless Social Confidence gives you more than victory over shyness – it gives you social invincibility and forever eliminates the feeling that you’re just not good enough. With his bestselling books, Frank Lawlis has brought psychological relief to millions. In his latest book, he addresses one of the most common challenges of everyday life – dealing with stress and anxiety.